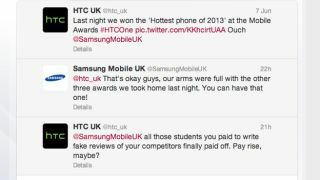 HTC and Samsung took their bitter rivalry to Twitter on Friday with an unsavoury spat that saw the former accuse the latter of 'paying students to write fake reviews' of the competition's products. It all started after Thursday night's Mobile Awards ceremony at which HTC took the 'Hottest Phone of 2013' gong for the HTC One handset, which is also currently TechRadar's number one phone in the world. From its UK Twitter account, HTC tweeted: "Last night we won the 'Hottest phone of 2013' at the Mobile Awards #HTCOne, Ouch @SamsungMobileUK"
To which the Samsung Mobile UK guys fired back: "@htc_uk That's okay guys, our arms were full with the other three awards we took home last night. You can have that one!" After that it got straight-up nasty, with HTC's UK social media team (perhaps nursing sore heads after a night quaffing cheap awards ceremony bubbly), swinging its handbag with this potentially-libellous accusation. The company wrote: "@SamsungMobileUK all those students you paid to write fake reviews of your competitors finally paid off. Pay rise, maybe?" The tweet refers to investigations in Taiwan that Samsung paid off students to post anonymous comments on web forums, slating the HTC One phone, but the allegations are yet to be upheld. That left LG to wade in with a picture of the late British film director Michael Winner in his role from an insurance ad campaign along with a modification of the commercial's catchphrase: "Calm down dears, it's only a phone." The LG tweet also featured a link to the LG Nexus 4 phone, ensuring its name wasn't forgotten within the conversation, and that was the end of the matter. HTC has been pretty pugnacious towards Samsung on social media lately, with plenty of tweets mocking the Galaxy S4 launch event, which was admittedly pretty mockable. It seems the company has been given the green light from the Taiwan for a more fiesty Twitter strategy as it seeks to reign in Samsung's giant sales lead.